What Is Wrong With This Entry? The following is an excerpt from an email Q&A session, which offers a great lesson for us all to share – the importance of correctly assessing the bias. Am I wrong in searching for answers in my entry timing? Should I rather be looking at making my momentum reads more accurate? Or is it my momentum reads on the lower timeframe that takes place inside my entry formations that need attention? 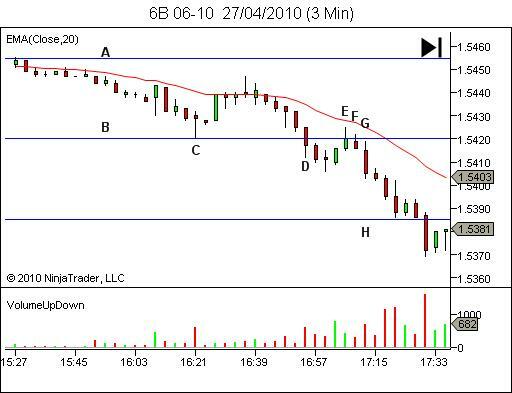 I attach an example of a Eur trade that illustrates my problem. It is a breakout failure that I wanted to trade. After the third attempt at the lows it took off in my intended direction without me after I took two losses attempting to enter. I did not enter this third attempt since I then doubted it would continue higher. Any ideas on what I can focus on to improve my entry timing? Accepting that I have only one trade sequence to use in assessing your current challenges, hopefully the following response will prove worthy of such a great question, and provide you with some insights for the way forward. My immediate thoughts on seeing your chart is that… you don’t have an entry problem. 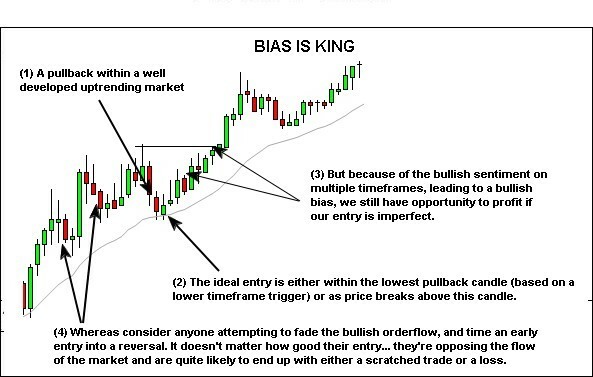 You have a problem identifying the bias (the likely path for future price action, or the future trend direction, or whatever other term you like), and possibly a reentry (psych) problem. Let’s look at bias first. Why do I say this is a bias problem, rather than an entry problem? Because if your assessment of bias is right, you can be quite imperfect with your entry and still have opportunity to profit. Whereas if your assessment of bias is wrong, even a most technically perfect entry will still place you in threat of a drawdown and likely loss. Let’s move now to your example. We’ll begin by blanking out all other price action and examining the quality of your entries. (Note: my candles look slightly different to yours, which is just the pip or two difference between your spot forex broker and the fx futures. The concepts discussed are still applicable though). From a technical perspective, both entries are very similar in technique. And both are a great method of entering the market at a point of short-term bullish sentiment, which was evidenced by price rallying for the following couple of candles. 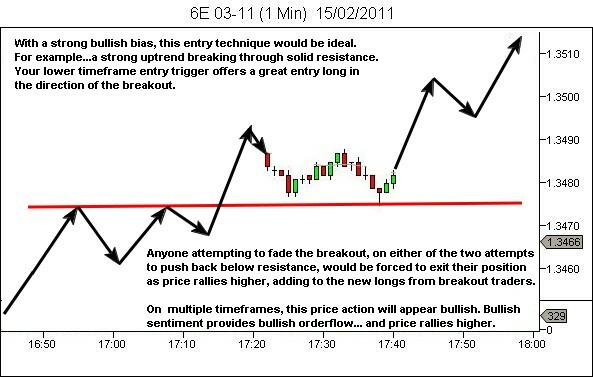 Had such an entry technique been used with a clear bullish bias, it would likely have secured you an early low-risk entry into a high probability move, as bullish sentiment and orderflow carried your trade through to greater profits. The problem then is not entry (which you’re already good at)… but when to make your entry decision. And this is a problem of assessing the bias for future price action, or the path of least resistance (there’s too many names for this concept!!!). 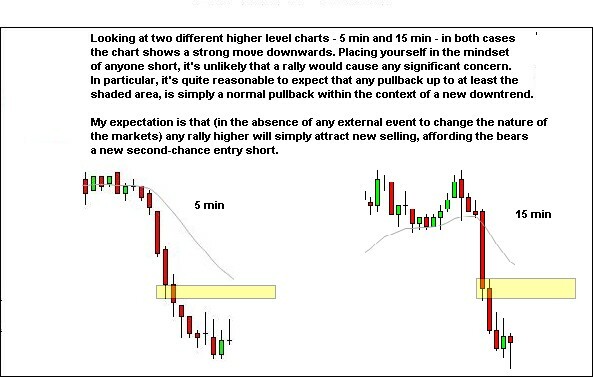 Let’s look at the market at the time of your entry attempts, through your higher timeframe 5 min chart. 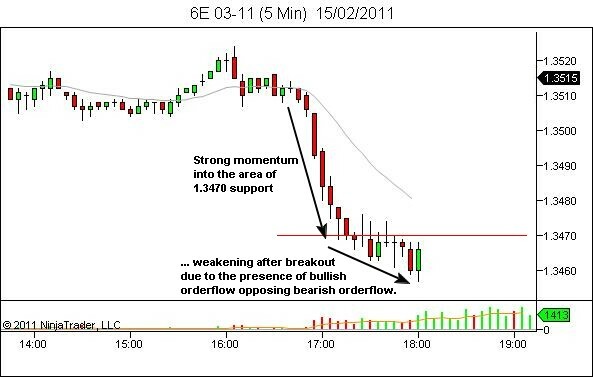 You correctly identified slowing momentum, as price broke the support in the vicinity of 1.3470. The question then is, where is price likely to go from here. 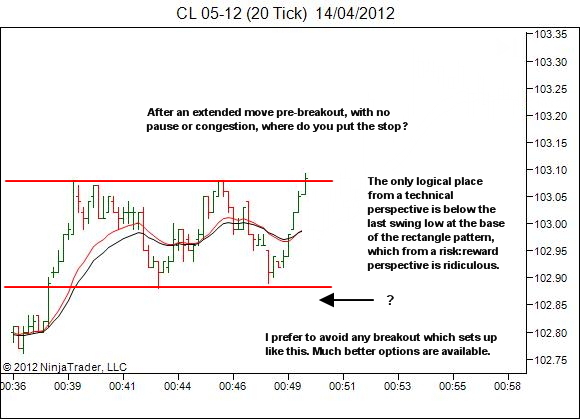 Weakness is clearly displayed after the point of breakout, but is that likely to lead to a reversal long? Or is a rally more likely to bring in more selling, leading to a continuation lower? Your analysis clearly expected a breakout failure and reversal. 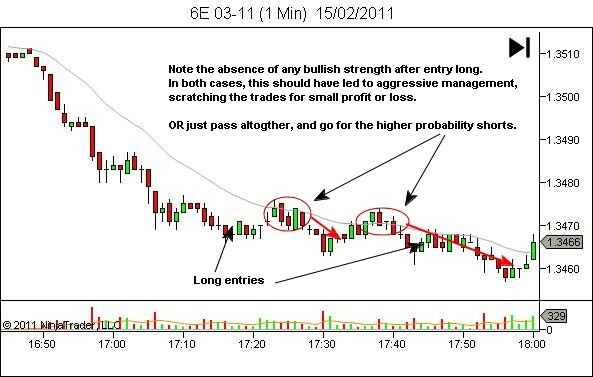 Your entry technique expertly picked a point at which short-term orderflow would be bullish, getting your trade off to a good start. Continuation higher though (eventually forming a reversal), will require fresh bullish orderflow. This will require a wider following… with other timeframe participants also switching to a bullish sentiment. Your assessment of bias will then depend on whether you feel that a push higher will bring in sufficient new bulls, or cause sufficient numbers of shorts to cover their position, to overcome any new selling. Let’s see how any pullback might look to traders of the 5 or 15 min charts. So, is a rally likely to lead to wider bullish support? Given the bullish pressure that’s occurring at or below 1.3470, and the likely bearish pressure that will occur above, and in the absence of any external event which changes the supply/demand dynamics of the market, I’d expect that price would most likely settle into a period of sideways consolidation. My expectation is for sideways ranging action. The higher probability trades would be the short entries at the top of consolidation. Longs (if taken) would be managed very aggressively. What would give me confidence in the long direction? I typically will require either a confirmation of change of trend, or some evidence of strength in the long direction and weakness in the bearish direction. 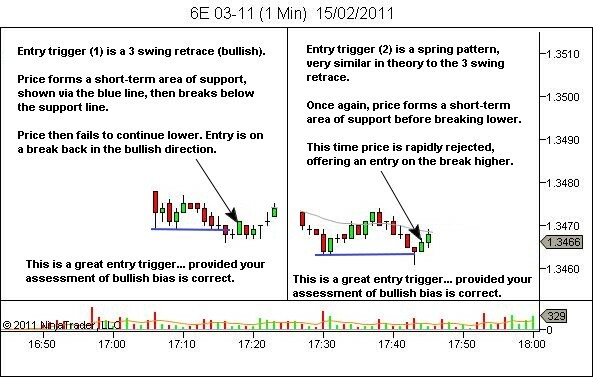 This is exactly the scenario you mentioned in your email ("I have thought about waiting for strength to enter the market and attempt entry only on the first retracement, but as per your teachings on fading weakness that’s normally too late to enter after strength (even if it is on the lower timeframe ?)"). I’m not sure why you thought I don’t recommend that. Identify strength in the bullish direction. Fade the weakness on the pullback. It’s a great plan. Does this mean your attempted breakout failure trades (long) were invalid? No. The breakout did occur and price did show weakness in the bearish direction. Your entries are valid. I may well have taken them myself. However, given the context within which they occurred they should either have been treated as a higher risk scalp back to value, or passed entirely, with preference given to pullback entries short (BPB trades, for YTC PAT readers) as the short-term bullish move failed. And… if we do discover that price rallies higher with strength and we missed the move, so be it. Reassess your bias and look for the next opportunity; watch for a weaker pullback and an entry long. A couple of points to wrap up. 1. Re-entry… I mentioned that as a potential problem as well, given your comment that you didn’t have the confidence to take your third entry after the first two produced losses. Confidence in re-entry is a whole subject on its own, but in this example we’ve highlighted the importance of recognising when a trade is lower probability (due to being against the larger bias), and managing it aggressively. Both your long entries offered sufficient potential to exit a portion with a small scalp profit, with the remainder scratched on premise failure for close to breakeven. At worst case, these two trades should not have produced much of a loss at all. Certainly, they should not have hit their stop with a full position. Through active management, risk can be contained, reducing the fear of subsequent entries. Of course, experience is a vital factor here as well. 2. Why did the market rally? It’s nothing to do with technical patterns. There was an external event which changed the supply/demand dynamics of the market. 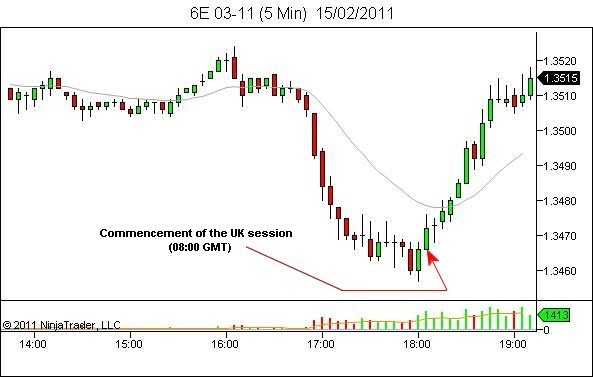 In this case, it was the open of trading in London at 08:00 GMT. The open of a new session provides a whole new source of orderflow, and can often change the nature of the price action. I would suggest that your entries were excellent, if your assessment was for a change to a bullish bias and rally. Recognising the trend you’re fighting though, your trades should have been managed more aggressively. However, the fact that price continued to push lower, stopping out both trades, shows you failed to correctly assess the wider bearish sentiment within the market. The bias for this market was not for higher prices. Higher probability options were through waiting for a pullback to fail, allowing re-entry short. This is the benefit of post-trade (or session) reviews. Learning is a result of assessing the gap between what you expected to occur and what did occur. 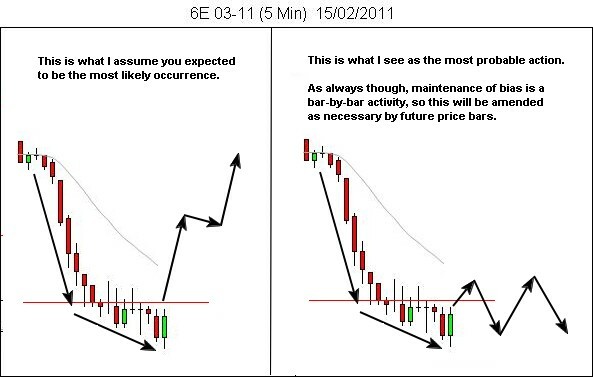 Review your charts post-trade from this perspective. 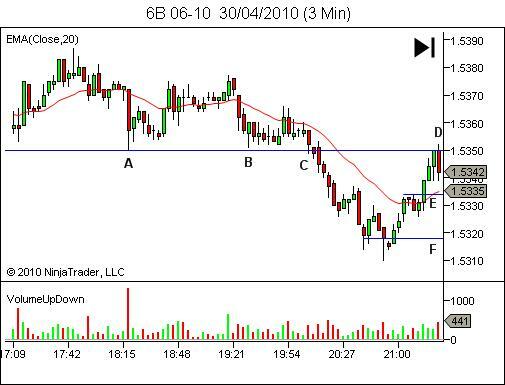 And if possible, re-trade the sequence in a simulator, using a market replay feature. Where were the signs that bearish strength was stronger than expected? How could you have seen this in the live market, and how should you have reacted? Improvement comes through reinforcing the lessons found in our post-trade and post-session reviews. note that Stan’s expectation for a reversal comes as a result of the sixth principle. 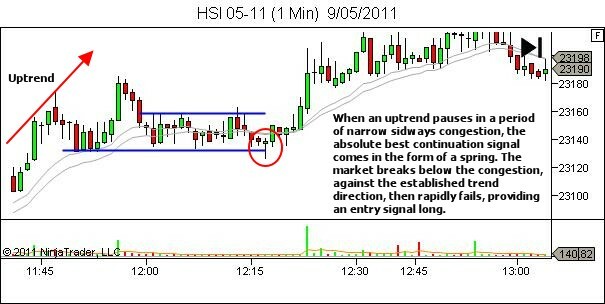 Strength was shown on approach to the S/R barrier, and it did result in the breakout. Weakness was then evident post-breakout, leading to an expectation for breakout failure and reversal back through the area of S/R. However, it’s important to note that this does not automatically mean we get a complete reversal of trend and a bullish rally. The expectation was met… price did rally (albeit only a short distance). Subsequent expectations depend on the following signs of strength and weakness. You may recall this discussed in the "future trend – simplified" video, where we discuss the fact that the trend is trusted until evidence of it breaking, or evidence of strength against the trend. In this case, you’ll note the lack of strength shown in the rally after both of his entries. This then leads to a further expectation of failure of the rally (potential breakout pullbacks). The market was in a bit of a stalemate at this point. Bullish orderflow from below; bearish orderflow from above. It wasn’t till the introduction of new orderflow at the start of the UK session, that clear direction was provided. Every now and then I get a question I just can’t answer, which is great because it gives us both an opportunity to learn. If anyone can help with this, I’d love to hear your thoughts. Please email me. I have a real question to ask as I really don’t know the answer and have been pondering it as one of my obsessions with trying to understand the market/s. The question surrounds the basis for support and resistance prices but as I think about it, it can also apply to trend lines as well. And specifically, I am thinking about indices. I understand the notion of support and resistance with individual stock, futures and currency trading. They are unitary in that they are not comprised of any other combination of securities. However, thinking about an index like the S&P 500 or the Dow is a bit of a conundrum. Consider: An index like the Dow or the S&P are merely a number of individual components mathematically weighted and summed to create a resulting value. In the case of the S&P there are ~ 2700 issues in this mathematical total called the S&P 500. Yet, one looks at these indexes as if they were a singular entity when in fact they are only a summation of the many individual elements. How is it possible and what is the mathematical basis for 2700 issues converging exactly in such a manner as to create a specific resistance or support level in the index given that each is only a component of the index and not all traders/investors, trade all of the issues in exactly the same proportion at the same time? 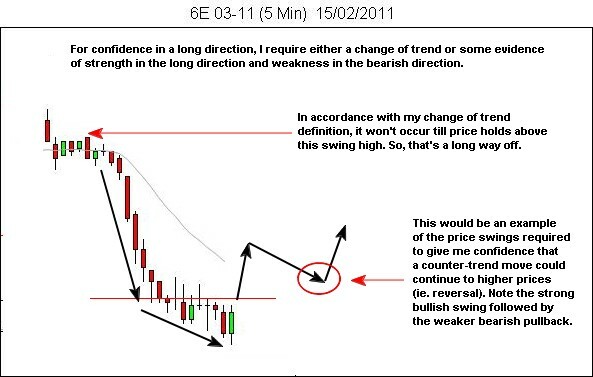 Support and resistance levels may well apply to an individual issue but somehow, it doesn’t make sense that they all conspire to create specific and repeating support and resistance levels in the index to which they are only a part. I hope what I expressed makes sense. It just is one of those fundamental understandings that have been bothering me and that I believe can apply to a better understanding as to why the support and resistance levels seem to appear consistently on the indexes. Of course, you can trade the DIA which is just a 100th of the DOW but it’s only a divided value of the DOW and thus inherits the same index properties. The same question applies here. I have never heard this issue discussed or illuminated and I can find no discussion on the internet. Any thoughts? Once broken, key areas of support will often act as resistance. Vice versa for key areas of resistance, which when broken will become future support. Let’s look at an example, of support becoming resistance. The beauty of this example is that it’s a challenging one from a trade management perspective (especially for people like me who actively manage their positions), so there’s a lot to consider in this example. The chart below is a recent 3 min GBP/USD chart showing support (created by earlier price action) tested again at A and B, before breaking at point C. Previous support now becomes potential resistance, as price rallies up to point D.
Feedback from the last article (Breakout Pullbacks – Sometimes They Come Fast) was very positive. Thanks! It seems that people want more examples of setups. Ok. So, here’s another, this time with a more ‘normal’ breakout pullback. I don’t often get an opportunity to trade the UK open but did so this last Tuesday, and it provided a great setup from the Asian session range breakout. A = possible resistance formed by the high of the Asian session price action. B = possible support formed by the low of the Asian session price action. C = a retest of the support area. E = pullback to the point of the breakout. Note the upper tail showing rejection of prices above this level. F = the subsequent candle, once again unable to push to new highs, and in fact closing back down on its lows. Bullish demand appears unable to sustain this pullback and force price back into the range. G = point of entry either on the break of candles E & F, or if you prefer on the break of the swing low. The entry on the break of candles E & F provides a risk of 12 pips, with a potential reward of around 30 pips down to the next support level, H.
Breakout pullbacks – one of my favorite setups. Unlike most Support & Resistance traders, I prefer not to automatically enter on a breakout (although I won’t absolutely rule it out, such as when price bases before the breakout to allow a good low-risk position for a stop). Instead, I watch the breakout for signs of one the following opportunities – a breakout failure trade or a breakout pullback trade. 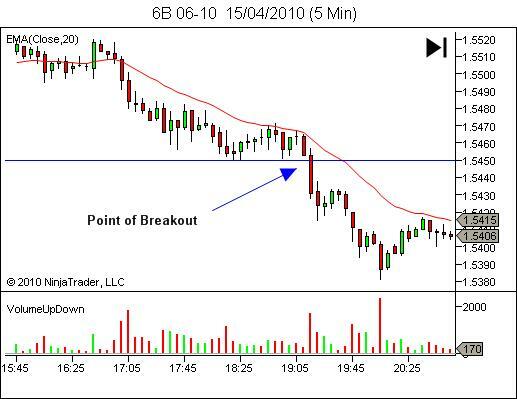 The following is an example of a breakout pullback, demonstrating the fact that sometimes, they come really fast. In fact, on the trading timeframe below, the pullback is not even visible. It occurs within the breakout candle.